Here at BlocPower we celebrate the values and ideals embodied in the Earth Day movement. This week as we reflected on the importance of Earth Day, we spoke to NBC to share how we create more sustainable cities using technology and engineering innovations. Learn about you can get involved through our crowdfunding platform to help reduce greenhouse gas emissions in our community. The first Earth Day was held on April 22, 1970, building off of increasing awareness of air and water pollution in the United States. The event drew bipartisan support as 20 million Americans joined demonstrations across the country. The organizers’ ability to gain bipartisan support led to the creation of the U.S. Environmental Protection Agency, and the passages of the Clean Air, Clean Water, and Endangered Species Acts. BlocPower works every day to reduce greenhouse gas emissions and improve indoor air quality in low and moderate income communities. You can also help to reduce fossil fuel usage and invest in improving air quality and health in New York City by supporting one of our fully vetted, “shovel ready” green building retrofit projects. 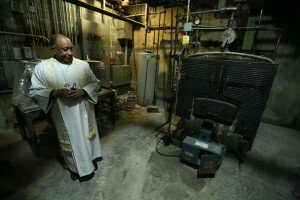 Reverend Leo W. Curry in the basement of the Fordham United Methodist Church in the Bronx with a boiler that will be replaced with an energy-efficient boiler.